See Spot Splash 2015! We’ve been waiting an entire year for this, ever since we went to See Spot Splash 2014. And we had just as much fun this year as last! Note: See Spot Splash is an annual event put on by the Idaho Humane Society. 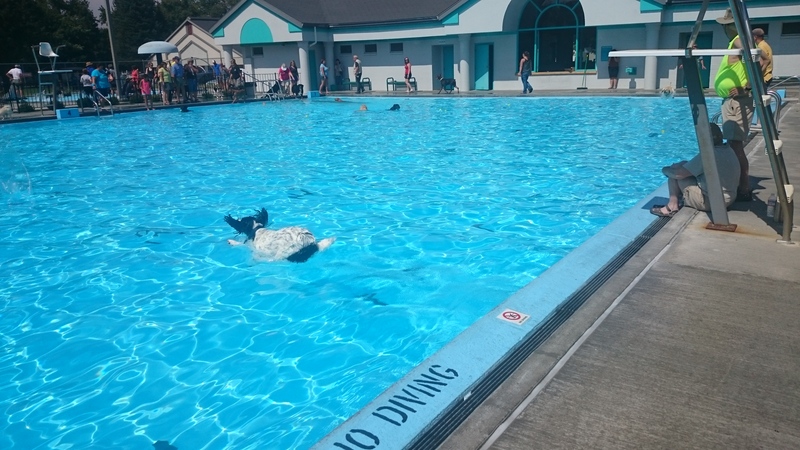 The day the public pool closes for the summer, it opens up for one afternoon to the dogs of the city. It’s a blast! A.J. has now spent enough time in the water that I didn’t think we’d have to go through his whole routine of running around barking at things in the pool until he finally fell in. I was wrong. We threw the tennis ball into the pool, and he ran around barking at it. Other dogs started to jump in the pool, and A.J. ran around the edge barking. He went right to the edge, leaned way over, took a drink (ick! ), and backed away. Then he’d start barking again. However, this time it only took three or four minutes for him to finally slide himself into the water after a tennis ball. After that, there was no keeping him out! I’d enforce short breaks every now and then, but A.J. didn’t want or probably even need them. We kept throwing the ball, he kept diving in after it. 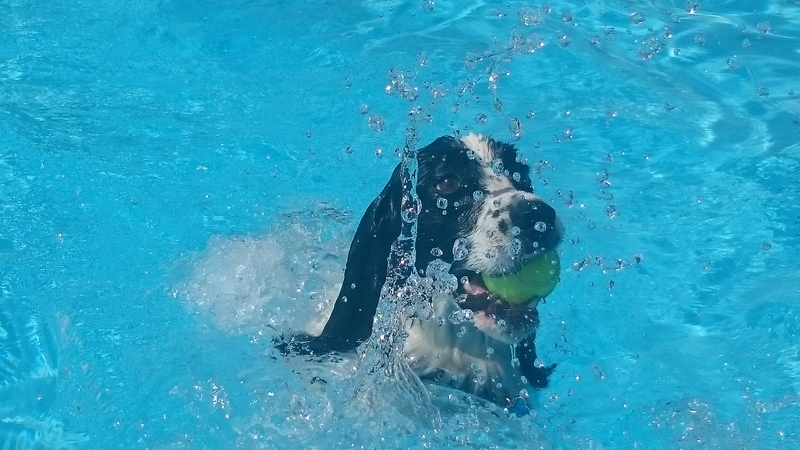 If we didn’t throw the ball, he’d dive in after another one floating in the pool, often with his ball still in his mouth. A.J. splashing away at See Spot Splash 2015. The funniest thing he did all day was to continually try to collect multiple tennis balls at once. He’d jump in after the ball we threw him, swim over and grab it, then try to grab another one that was floating nearby. A.J. can’t fit more than one ball in his mouth at a time, but he kept trying. And each time he’d finally have to give up and swim back with just the one tennis ball. Different volunteers came up to us throughout the hour telling us they were giving A.J. the “best diver” and “best staying power” awards. One of the photographers there kept trying to capture a good picture of A.J. diving in. (I’m not sure if he ever got a good one, but we tried several times.) A.J. tends to attract a lot of attention wherever he goes. A graceful dive landing at See Spot Splash 2015. After about half an hour the big pool had cleared out quite a bit, only the wading pool was full of dogs. But A.J. was still going strong. I don’t think anyone believed me when I told them A.J. was still going to want his walk tonight. But within 10 minutes of being home, A.J. was outside running around barking. He really doesn’t wear out. That’s my crazy boy.